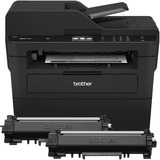 The Brother MFC-L2750DW XL is a compact, durable monochrome laser all-in-one with up to 2 years of toner in-box (Approx. 300 pages per month in accordance with ISO/IEC 19752 (Letter/A4) using the 2 toners provided in box) with approx. 7,500 pages included (Approx. toner cartridge yields in accordance with ISO/IEC 19752 (letter/A4)). Delivering class-leading print speeds up to 36ppm (Based on competing in-class monochrome laser multifunction printers under $300. Print speed specifications gathered from manufacturer websites as of 1/9/2017) that is perfect for small offices. Flexible paper options with an up to 250-sheet capacity paper tray and 50-sheet automatic document feeder for single-pass duplex copying and scanning. NFC "touch to connect" printing and scanning (The mobile device must have NFC capability and run Android OS 4.4 or later) and wireless printing from compatible mobile devices (Requires connection to a wireless network). Offers wireless networking and Ethernet connectivity. The 2.7" color touchscreen display enables menu navigation and creation of workflow shortcuts plus print-from and scan-to a variety of destinations including popular cloud services (Requires an Internet connection and an account with desired service). 2-year limited warranty plus free support for the life of your product.